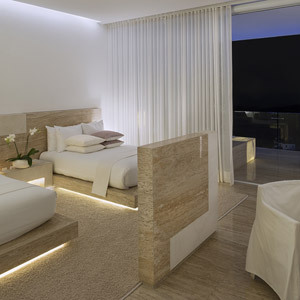 In Acapulco’s Hotel Encanto, the walls of the guest rooms are completely bare. 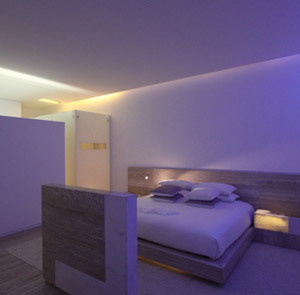 Architect Miguel Angel Aragones relies on the interplay of natural light and shadow — with a healthy assist from lighting designer Gustavo Avilés’ sumptuous pastel washes — to create a unique art-hotel experience for each guest. Thanks to Avilés, Encanto’s tropical minimalism eschews urban coldness in favor of celebratory neon, evoking the luxury resort spirit of Acapulco in the Fifties and Sixties. During the day, the hotel’s exterior is blindingly white. By night, standing out by the pool, it’s possible to look up and see the what makes Encanto special: the rectangular boxes of blue, yellow, and green light are spacious private balconies, one for each of the guest rooms — half of them, incidentally, feature private plunge pools. 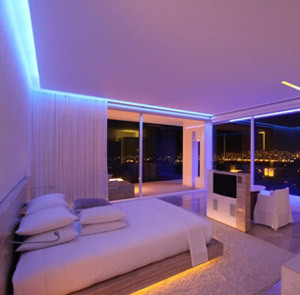 Inside each room the furniture is streamlined and geometric, leaving plenty of unobstructed space for the ocean view. Naturally, flatscreen TVs and wireless internet are standard, while the bathrooms offer dual sinks and an array of L’Occitane products. The public spaces are just as uniquely crafted, with an emphasis on casual comfort providing a welcome contrast to the modernist feel of the rooms. In a mildly surreal touch, trees grow from the pool, while canopied daybeds and beanbag chairs compose the outdoor cocktail lounge. 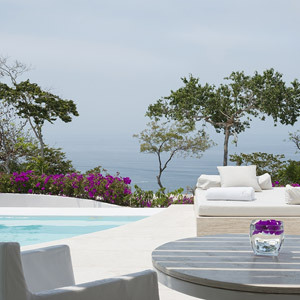 Encanto’s restaurant, Flor de Mar 360, offers seasonal Mexican cuisine with an Asian flair — improved immeasurably by the panoramic view, of course. Encanto is about a 30 min drive from General Juan Alvarez International Airport. The hotel can organize airport transfers for 450 Mexican Pesos. Please contact CustomerService@TabletHotels.com for assistance with airport transfers.